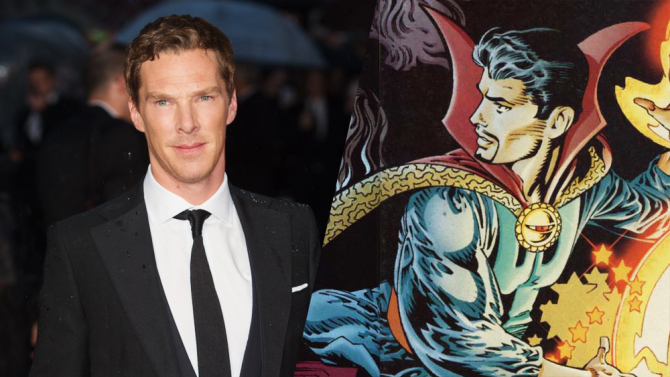 Cumberbatch Strikes Again as Marvel’s Doctor Strange! Cumberbatch a Superhero? Marvel may have found its Doctor Strange, it was revealed last week! You knew it would happen sooner or later! Lady Anglophile is going to need a whole team just to cover the career updates of Benedict Cumberbatch alone! The Imitation Game star is everywhere these days. From his hilarious guest spot on Graham Norton where he was introduced to his wax likeness, to his Oscar-buzz generating role as mathematician Alan Turing, to his animated “pengween” spy in Penguins of Madagascar, to ferocious Smaug in The Hobbit; The Battle of the Five Armies…Cumberbatch is keeping his (most likely ecstatic) agents and publicists quite busy these days. Cumby is on everyone’s A-list these days, but this deal is contingent upon his hectic schedule which is tricky to say the least and which includes (hopefully) another season of “Sherlock” and of course Hamlet on stage in the West End next year. But if I were a betting woman, I’m willing to say Cumberbatch will find time in his busy schedule to become a Marvel Superhero! Cumberbatch is repped by (some very happy agents at) UTA. This entry was posted in Lady Anglophile Reviews & Other Bits and Bobs, The CumberWatch and tagged Benedict Cumberbatch, Doctor Strange, Marvel. Bookmark the permalink.